Is it time to let go of physical game discs? Microsoft recently demonstrated its new Project xCloud streaming technology, a prototype cloud gaming service that will one day allow players to stream games over the internet and into their televisions, phones, tablets, web-enabled toasters and any nearby uncles’ pacemakers. It’s essentially Netflix for games, broadcasting a powerful blast of unadulterated videogame energy through the air all around us. It will beam Forza through our skin, into our bones and out the other side. In this incredible future you’ll be able to breathe in raw Xbox data, and exhale pure digital entertainment. 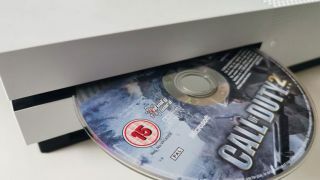 And while its creators are adamant that cloud gaming won’t spell the end of physical games consoles, it should at the very least hasten the demise of physical disc-based media. Which is good news, because discs are bad. I hate discs. Stupid shiny circles, lazily reflecting whatever is placed in front of them, even when that thing is horrible like a car crash or a sad dog. Discs are pathetic relics of a bygone era, outdated plastic pancakes tethering us to the past like time-anchors. With each new generation of console comes the familiar promise that this time, this time, the disc drive will be ditched. But each time it reappears, unbidden and unexpected, like your mum’s boyfriend at your birthday party, and you just sort of have to deal with that. Blinx The Time Sweeper: Indirectly responsible for the destruction of the Great Barrier Reef. Discs once served a vital role in society, approximately one hundred years ago, back when we didn’t have unlimited internet spilling out of clouds and flowing out of every hole in our homes. Back then, game developers would use special micro-chisels to carefully engrave their games onto tens of thousands of plastic discs, by hand, before posting them to HMVs, Virgin Megastores and Electronics Boutiques up and down the country. "The Lake District is strewn with old copies of Hydro Thunder Hurricane"
Gamers would ride inside specialised lorries called buses to visit these stores, where they would exchange shells, beads and clumps of old hair for the game disc of their choice, before returning home to insert the disc into their games console, which back then was the size of a Mini Cooper. As awful as it sounds, it was the only reality we knew. While today’s game discs are delivered to our homes by somebody on a zero-hours contract, the underlying technology is still the same, and the problems are just as pronounced. Physical discs take up space on our shelves, they dazzle passing birds or elderly relatives, and they contribute to climate change. The great barrier reef is littered with discarded copies of Blinx The Time Sweeper. The Lake District is strewn with old copies of Hydro Thunder Hurricane. It’s a senseless waste. The solution is simple: we all need to become Buddhists. Physical discs have survived this long for two reasons. Firstly, some people – especially in the northeast reaches of Great Britain – have never heard of the internet or cars. Secondly, many people are sentimentally attached to their physical collections of games, preening over them like futuristic robot librarians, safe in the knowledge that in the event of a nuclear blast wiping out PlusNet’s servers they’d still be able to play Ashes Cricket 2009. The first case could be solved by having the internet delivered by van to remote areas twice a week, like that guy who smelled like a betting shop and used to drive around our council estate, selling vegetables and renting out bootleg VHS cassettes. The second could be solved with the careful application of Buddhist teachings, the rejection of materialistic thinking, the dissolution of the concept of possessions and the adoption of a new ascetic lifestyle atop a Himalayan mountain. As long as it’s one of the Himalayan mountains with a really decent fibre optic connection. The Fixer takes aim at more video game cliches, overused tropes and general nonsense every month in Official Xbox Magazine.